At last, it is DONE! 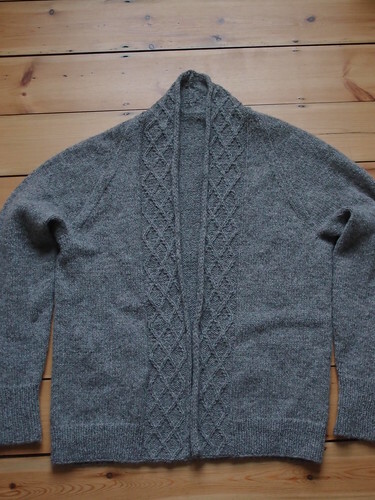 This is the cardigan I promised my little brother about, oh, it must be several decades ago by now. And when I say little, I mean that he is younger than me, not smaller than me. He’s built like a Sasquatch (and I say that with love and only a little exaggeration). He never really gets cold, so I didn’t want to make anything too heavy, which meant I ended up knitting a 44 inch DK-weight cardigan on 3.75mm needles. 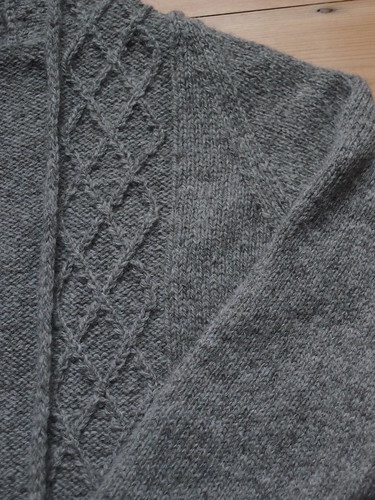 The pattern is Schoodic by Hannah Fettig which is, technically, a girls’ cardigan, but it required very little alteration to make it unisex. I simply cast on for the chest measurement I was after (giving him somewhere between 2 and 4 inches of positive ease) and made the body shorter, so that it stops at his hips. Other than that, I followed it as written. It’s knit from the bottom up, in one piece, and whilst I’m always a little wary of this construction, since you can’t try it on as you go, it works really well for this style of cardigan (see also Aidez). 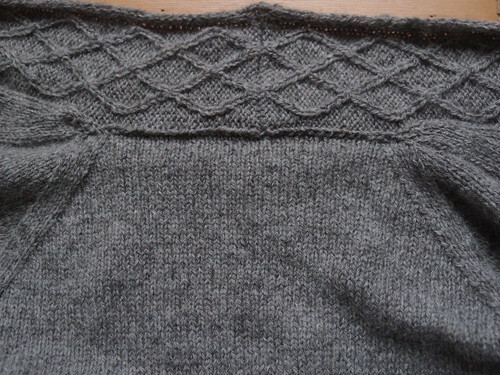 The cables are very easy to do without a cable needle, and also intuitive – after the first repeat I didn’t need to look at the pattern. Once I joined the arms and was onto the raglan shaping, I thought the whole thing would speed up a little – at least I was eliminating 8 stitches every other row, right? But look at the depth of that armsyce! It’s a world of neverending armpit that almost broke me, but I soldiered on through to the neck shaping. 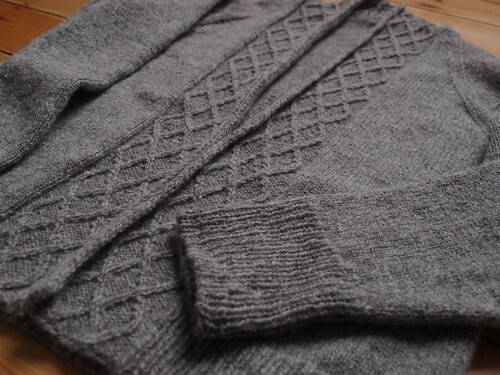 As you knit the cabled bands at the same time as the body, once you finish the raglan you bind off the stitches at the back of the neck, and then knit the cabled bands either side until they meet in the middle and seam them with a three needle bind off. At which point you’re left with a big gap between the back of the neck and the neck band, which needs to be seamed. On Aidez, I kept the back stitches live, and joined them to the bands as I knit them, but I wasn’t entirely pleased with the result. This time, I opted for a seam, though it would have been helpful if the pattern had some specific tips about how to do this. In the end I improvised, and was pretty pleased with the result. The finished cardigan is one I would be quite tempted to steal, if it wasn’t so humongous. The yarn (Lanark DK) is a mountain of fluffy, sheepy, cosiness after blocking, and it’s a really easy style to throw on over whatever you’re wearing. Even after blocking, the bands do roll quite a bit, so you might want to alter the edging if that’s going to bother you. But overall I’m really happy with how this turned out and will definitely be looking into adapting other women’s patterns for men. 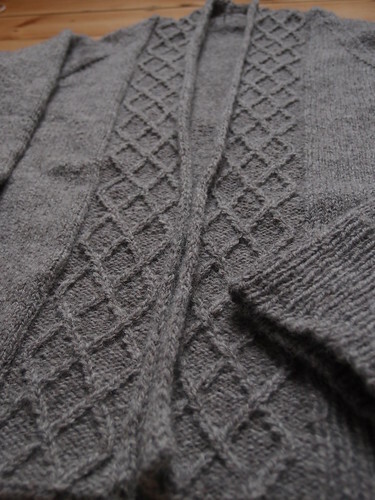 This entry was posted in Knitting and tagged knitting for men, Little Brother, men's knitting, men's patterns, Schoodic. Bookmark the permalink. Lovely! My husband is equally Sasquatch-esque, and long-waisted, which makes for eternal knitting. At least he is knit worthy. Mostly I make him socks, but there again we have the jumbo feet and eternal knitting problem. You did well to stick it out. Well done! It would be good to see the cardie modelled on your brother’s statuesque figure. His head need not be in the picture if is shy – its just to see what the garment looks like on the body – as it were. Well done – this rates gin and cake! It’s done! And it looks gorgeous! lucky little brother!